When I think of zucchini, I think of other foods, which have super-powers. For instance, the classic “B” movie Attack of the Killer Tomatoes comes to mind. Then there was the “Eggplant That Ate Chicago.” Or else I think of the Blancmange which ate Wimbledon, on Monty Python’s Flying Circus. As with the tomatoes, eggplant, or blancmange, zucchini will take over, if you give it half a chance. Do not turn your back or close your eyes for a millisecond. Be afraid…very afraid of this green garden menace. I do not grow my own zucchini, as I know that I will benefit from others, whose gardens are overflowing with the squash. On my island within a matter of days, I received one zucchini as a party favour, if you will, at the end of a dinner party (how can one say “no, thank you”?) and then a phone call from a neighbour who was trying to unload her excess. I accepted the second offer, too, as there were a couple of cucumbers thrown in to make it irresistible. Now I know to wait until August for the largesse of zucchini. 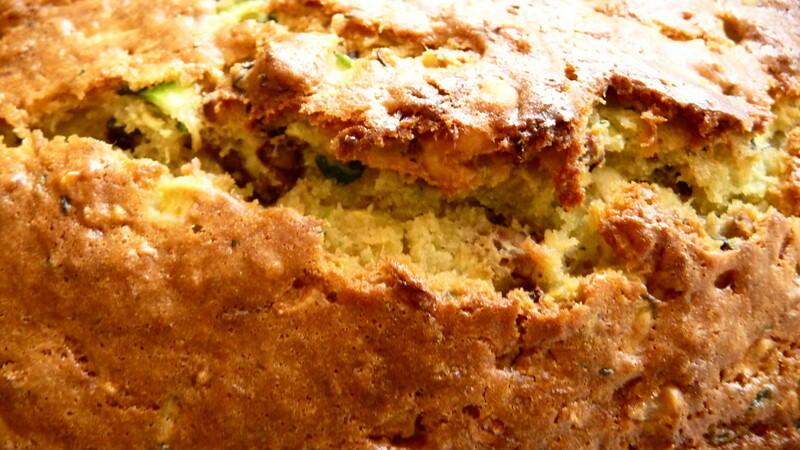 This year, however, was the first when I finally decided to finally try zucchini bread. In addition to using two of the three aforementioned squash I received, I wanted to finish up some light sour cream in the fridge. 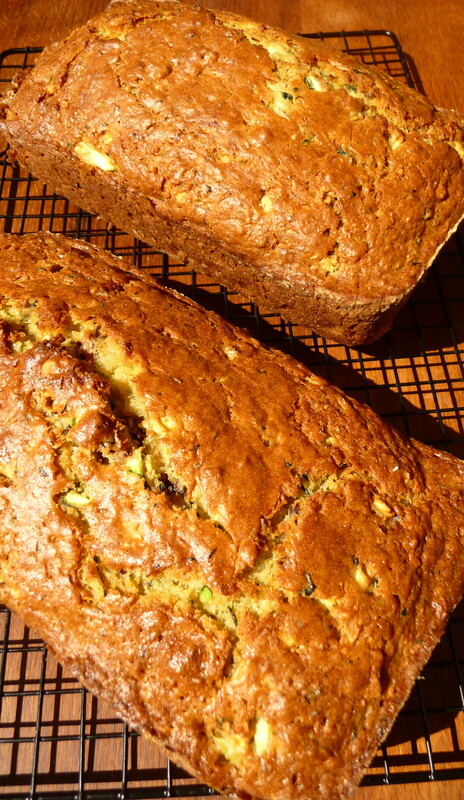 America’s Test Kitchen’s New Best Recipe (ATK) had an attractive option for zucchini bread. The ATK version makes one loaf, though it uses yogurt instead of sour cream. Despite their warning that sour cream made their loaves too heavy and rich, I went ahead with it anyway. ATK – like the zucchini-zombies – could not scare me away. I always appreciate ATK’s rigourous experimentation with ingredients, technique, cooking times, pans, etc. Their recipe stated that the subtlety of the zucchini can be lost, when many other spices are used, e.g., cinnamon or nutmeg, so they limit flavour-boosters to lemon juice to brighten the taste. This approach works well, so I give them credit for their thoroughness, as always. The only drawback, perhaps, is that it is rather time-consuming to shred/grate the zucchini, before draining in a strainer and drying it in paper towels after 30 minutes. Even using a food processor, this is a bit of a long recipe – another reason to double the quantities and bake two loaves. I strongly advise doing two at once, as the bread freezes well or lasts three days, tightly wrapped, at room temperature. The bread has a fine crumb. This is attributable to the yogurt, or sour cream, and the lemon juice. I found the zucchini flavour to come through in a distinctive and pleasant manner, but it was definitely not over-powering. 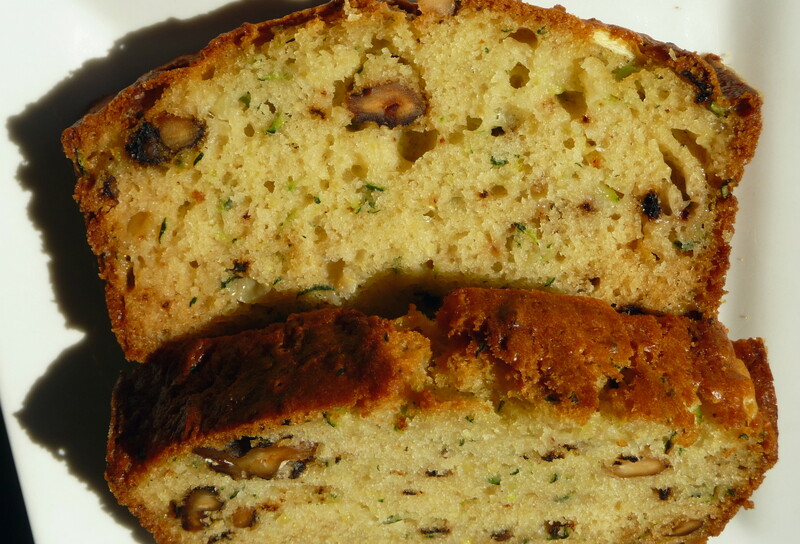 The toasted walnuts add a crunchy textural counterpoint to the rich body of the bread, which really is more like cake.